Between March 2002 and July 2004, eight individuals of Chechen origin were “arrested by groups of armed and masked men in a manner resembling a security operation”. Pointing guns at the family members, the soldiers took men away in military carriers. Similarly, on April 28, 1991, Jeremías Osorio Rivera was officially detained by a military patrol when he went to the village of Nunumia to take part in a sports event. He was accused of making a terrorist threat for carrying an officially registered gun and explosives materials. None of these men have been seen or heard from since, despite their families’ tireless efforts to find them. In both cases, the males were abducted and detained by armed men without arrest warrant, held in solitary confinement under mortifying circumstances for unidentified periods of time, and deprived of legal assistance or any other contact with the outside world. In both cases, after the abduction of the individuals and in the absence of any information about their whereabouts, the domestic criminal justice systems in the respective countries did not take any measures to provide remedies for determining the fate of the disappeared individuals. They also failed to safeguard the relatives’ right of access to justice and right to know the truth through effective investigation and through holding accountable those responsible for the crimes. 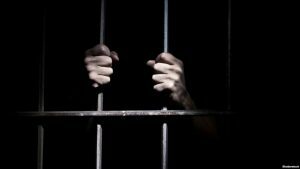 The aforementioned cases are typical examples of the crime that is internationally known as “enforced disappearance.” Today, this crime continues to take place in 88 states all over the world, and constitutes a continuous violation of multiple rights. Enforced disappearances emerged in international discourse after World War II, and the narrative of violations carried out by Latin American military dictatorships in the 1960s and 1970s shaped the development of this discourse. Since that time, the international community has begun to acknowledge that a wide range of human rights of both the victims and their families are denied by the act of enforced disappearance, claiming that states should be held accountable for their failure to prevent the disappearances, to investigate them, and to punish the perpetrators in light of their obligations under several international agreements. Despite the number of treaties and agreements signed in order to establish an understanding as to the nature of enforced disappearance and determine state responsibilities, the international community has repeatedly failed to create a conceptual framework for enforced disappearances and to establish monitoring mechanisms that can proactively address the problem. This is likely due to political influence in the shaping human rights norms. The context of the crime of forced disappearance implies that the perpetrator has an unfair advantage over the victim, because evidence is often under the exclusive control of the perpetrator, who typically has intent to hide it. 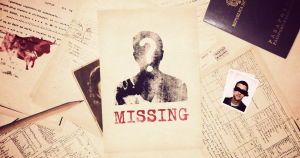 As a consequence of this distinctive characteristic of disappearances, it is up to international human rights bodies, such as the Inter-American and European Courts of Human Rights, to promote and protect individuals from this violation. Unfortunately, the details and procedures of implementing judgment are specific to each Court. Both courts can and do force states to pay financial compensation to family members of disappeared persons. However, the whereabouts of victims have never been established, and required remedies have never been fulfilled, causing severe suffering of the victims’ loved ones. Under pressure from the Inter-American Court of Human Rights and the Inter-American Commission, Peru adopted legislative amendments and provided special reparation policies. Overall, the Inter-American system has managed to develop valuable jurisprudence that still requires more work in terms of influencing state compliance. On the other hand, the European Court was not able to require any action to be taken by Russia as result of the judgment in the joint case of the enforced disappearance of the eight Chechen individuals referenced above, since it issues only declaratory judgments. Russia has failed to adopt any measures to ensure that no similar violations take place in the future, that violators are adequately deterred, or that family members of the disappeared persons are provided with necessary remedies. Overall, despite the gravity of the crime, enforced disappearance continues to be ineffectively addressed by regional and international mechanisms. Unfortunately, international human rights courts cannot do much to prevent this crime from happening, especially when the courts investigate cases in which one of the parties is a so-called “powerful” country. Even more unfortunate is the fact that the Courts fail to provide effective remedies to the family members of disappeared persons. While countless people around the world are subjected to injustices, international courts and human rights activists cannot do much about it unless states express their willingness to comply with the judgments. In this light, the most promising method would be to lodge interstate complaints against the countries that are not willing to comply with recommendations or declaratory judgments by creating political pressure. However, the questions remain: which countries will be able to proceed with this legitimate measure without creating political tensions, and how can non-governmental organizations influence this process? Marina Kumskova is a graduate student in Human Rights Studies Program at Columbia University and a research assistant at the Center for International Human Rights at John Jay College. In her research, she focuses on religious discrimination in the context of counter-terrorism policies. 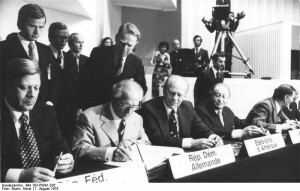 The signing of the Helsinki Accords on August 1, 1975 has little of the resonance today of such landmark events of the Cold War as the fall of the Berlin Wall in 1989, the rise of the Solidarity Trade Union Movement in 1981, or of the uprisings in Czechoslovakia in 1968 and Hungary in 1956. Yet on their fortieth anniversary, the Helsinki Accords deserve to be remembered alongside those events. And, in some ways, they have even more enduring relevance for world order and for human rights. The Helsinki Accords had their roots in the refusal of the US and its allies to accept the legality of the new borders and regimes imposed by the Soviet Red Army when it occupied the three Baltic states and six countries in Eastern Europe. American rhetoric in the early Cold War often referred to these as “captive nations” that were suffering under a Communist system that they had not chosen. Conversely, Soviet rhetoric sought ways to validate what they viewed as their hard-won geographic sphere of influence. By the mid-1970s, however, in an atmosphere of East-West détente, some three dozen countries began an intensive multi-year process of negotiations intended to stabilize Europe and strengthen international cooperation. The ultimate product was the “Final Act of the Conference on Security and Cooperation in Europe,” which is today better recalled by the name of the Finnish capital where the talks took place. The Helsinki Accords were loosely organized into four distinct “baskets” of issues, but the Soviets were mostly concerned about the “first basket” of security-related issues. Through these, the signatories agreed to uphold the inviolability of post- WWII borders and the integrity of existing sovereign territories within Europe. Soviet leaders believed these provisions would ratify and legitimize their grip on Eastern Europe. Many American conservatives agreed, deeming the Accords an appeasement by the West and criticizing President Gerald Ford’s decision to sign them. To the Soviets, this promise of individual rights seemed a minor concession when compared to the ratification of existing boundaries. In any case, Communist regimes considered individual rights as something always to be mediated by the state, and therefore entirely under the control of their regimes. Overall, they considered the Accords to be a diplomatic triumph, and had them widely extolled throughout state-controlled media, even printing their full text in societies that otherwise tightly controlled information. Soon thereafter, Charter 77 was established for similar purposes in Prague, which was led by playwright Vaclav Havel, who would 12 years later become his nation’s first post-Communist president. In 1978, a global organization called “Helsinki Watch” was founded to monitor implementation of the Accords in Europe. Ultimately, Helsinki Watch spawned parallel “watches” for the Americas, Middle East, Africa, and Asia—and then evolved into one of today’s preeminent international NGOs, Human Rights Watch. At the intergovernmental level, the Accords established a “Helsinki process” that became institutionalized through an ongoing Organization for Security and Cooperation in Europe (OSCE). A series of follow-up meetings afforded high-profile platforms for activists to present documentation of human rights abuses. The Soviet bloc countries weakly refuted such claims, but were forced to remain engaged in the Helsinki process in order to maintain their gains concerning recognition of existing borders. To add to the pressure for compliance, the U.S. Congress established a U.S. Helsinki Commission, which still functions today composed of commissioners from the House, Senate, and Departments of State, Defense, and Commerce. Forty years later, the Accords have begun to be cited again in the context of the Russian annexation of Crimea and other illegal interventions in Ukraine, Georgia, and Moldova. Ironically, such territorial incursions are the clearest violations since at least 1975 of the very principles of territorial integrity and inviolability of boundaries that the Soviet Union had fought for so assiduously as part of the Helsinki process. For those focused on human rights, the anniversary of the Helsinki Accords should not be an occasion for triumphalism, given the persistent violation of basic human rights norms around the world. But the Accords nevertheless are well worth remembering as a sort of slow-motion triumph for painstaking multilateral engagement, for the increasing relevance of both grassroots activists and transnational human rights NGOs, and most of all, for the empowerment of average individuals to demand their human rights. Raymond A. Smith, Ph.D. (GSAS 1999), is an Adjunct Assistant Professor of Political Science at Columbia and at NYU and is a Senior Fellow with the Progressive Policy Institute. 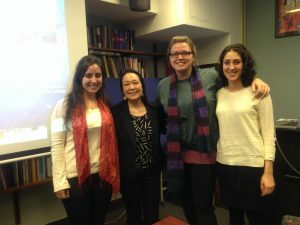 On November 20th Aviaja E. Lynge, HRAP Fellow at Columbia University, gave a presentation titled: “Indigenous Peoples’ Right to Education: Implementing a Culturally Appropriate Education System in Greenland.” Lynge holds an M.S. in Social Anthropology from the University of Edinburgh and currently works at the University of Greenland, where she is Head of Department for Further Education. Lynge began the presentation by thanking her mentor Elsa Stamatopoulou, Director of the Indigenous Studies Program at Columbia. Lynge, second from left, with attendees of her presentation.” Photo by Elsa Stamatopoulou. After earning her degrees abroad, Lynge returned home and became involved in reforming the Greenlandic education system. The driving impetus behind her work is the promotion of the right to education for Inuit children. Inuit peoples make up approximately 89% of the population of Greenland, but have been colonized by Denmark for over two hundred years. Although they became self-governing in 2008, the country is still working to transform deeply entrenched social, cultural, and political norms that have imposed European standards on the Inuit peoples. The westernized education system that was established by the Danes has exclusively rewarded students who excelled in learning the Danish language. 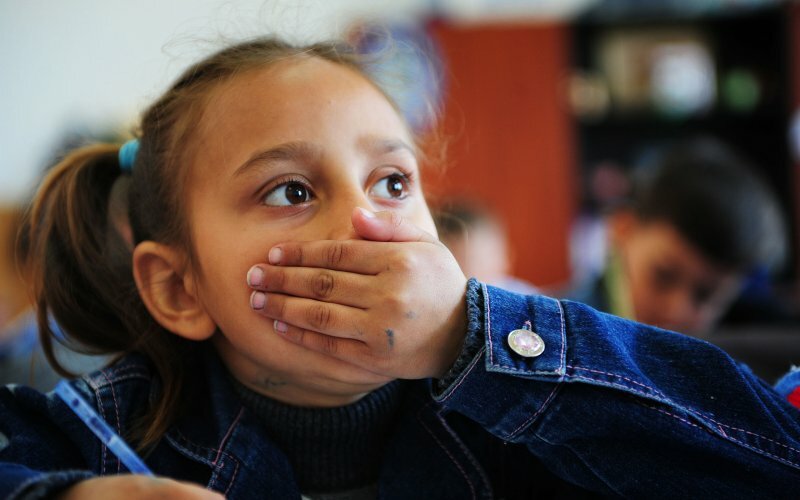 Students who can’t speak Danish aren’t even able to enter high school, which unsurprisingly has resulted in a lack of opportunities, the loss of socializing skills and low self-esteem. In many children, the internalization of shame has caused a paralyzing sense of being unable to learn and worthlessness. It is clear that in the historical discourse of Greenland’s school system, those who have succeeded have had to assimilate, creating a strong polarization between those who “make it” and those who do not. Moreover, this discourse has created an equivalency of Inuit culture and language with failure. 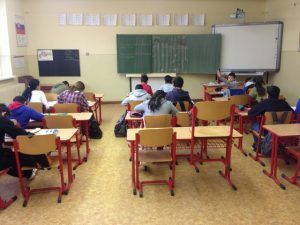 As it turns out, the majority of young people don’t make it in the system; 62% of all children can’t enter further education, and half of those who enter high school drop out. Lynge posed the question: How it is that indigenous populations, in general, are the least educated in the world? Avoiding our tendency to blame the parents, how can we turn it around and ask, what are we, as educators, doing wrong? Lynge works to redefine and restructure the national education system to utilize Inuit pedagogies. The country’s goal, supported by all political parties, is to create the “world’s best school”for the Inuit children that implement the ways they learn best. The hope is that they will not only have equal access to education, but equal access to success within it. Some of the pedagogical principles she is working to develop in the Greenlandic schools include: to respect and utilize silence in the classroom, as most Inuit children are raised to not interrupt elders and struggle with vocal participation; to make learning more of a collective process, rather than focusing on and rewarding individuals; to contextualize learning with concrete, visual examples and participatory, active learning; to encourage children to be their own evaluators and goal-setters, and be their own agents of change; and to emphasize a holistic approach to education that simultaneously nourishes children’s emotional, physical and intellectual selves. The most challenging aspect of Lynge’s initiative regards the controversy of including “culture” in the curriculum. The most common accusation she faces is that by emphasizing the importance of Inuit culture, she will be taking the students “back in time,” obstructing their ability to be part of a modern world. However, Lynge stresses that her goal is to employ existing Inuit pedagogies, skills that have been taught and learned throughout the past, and then meld these practices with new research and methods. Part of her project is actively working to try to change the common perception of culture as material. She noted that people tend to think of “teaching culture” as the creation of objects, such as clothing or art, whereas she considers it in an immaterial light, in terms of norms and values that can enhance the learning process. Lynge insists that culture must be understood in its intangible form and that it is compatible with the “modern” world. Caroline Fidan Tyler Doenmez is an M.A. candidate in the Columbia University Human Rights Studies program. Her main areas of interest concern sexual violence against indigenous women and girls in the US and Canada, as well as the collective rights to culture and education. On Thursday October 3rd, the Institute for the Study of Human Rights (ISHR), the Blinken European Institute and the Harriman Institute hosted Stavros Lambrinidis, the European Union’s first appointed Special Representative for Human Rights at Columbia University. Mr. Lambrinidis is an attorney who served as the Minister of Foreign Affairs of Greece. He also previously held the post of Vice-President of the European Parliament, and from 2004 to 2009, served as Vice-President of the Parliament’s Civil Liberties, Justice and Home Affairs Committee. Mr. Lambrinidis graduated from Yale Law School and, early in his career, served as Chairman of the Committee for Human Rights in the Bar Association of Washington, D.C.. Mr. Lambrinidis took office on September 1, 2012 and his mandate will run until June 2014. He and the EU delegation to the United Nations visited New York for the opening of the 68th Session of the UN General Assembly. Mr. Lambrinidis spoke candidly about some challenges his office and human rights policy face in today’s global community. Part of the challenge the European Union (EU) will face, he noted, will be to find a balance and consistency in human rights policy for the EU and for each member state. These consistencies include, for example, how internal policy is presented externally. Each state must recognize their own internal challenges in this regard. No state perfectly protects and promotes rights, a false sense of exceptionalism, often promulgated by Western countries, actually works to undermine their credibility in the international arena. Another concern relates to the complexities in ensuring consistency in the reactions to other states’ violations of rights; are the reactions to external human rights violations consistent and, more importantly, proportional? A state’s favoritism or criticism towards certain states may be seen as based on economic considerations, weakening the ability of that state to speak authoritatively about protections and promotion of human rights abroad. Regarding proportional responses, Mr. Lambrinidis also noted that, when possible, it is best to “win” a country’s respect for human rights and human rights practices, rather than resort to the use of force. Lastly, Mr. Lambrinidis is concerned with ensuring that there is consistency in EU policies on community, regional and domestic levels throughout the EU member states. Mr. Lambrinidis also spoke of his concern over the “false dilemma” of arguments that attack the universality of human rights and place human rights at odds with culture, religion or ethnicity. He urges that states must formulate a better argument to truly defend the universality of human rights in theory and, more importantly, in their practice and proliferation. He asserts that it is often repressive, nationalistic regimes pronouncing that human rights are a “Western construct.” By conceding to these narratives or failing to offer robust counter-arguments, we undermine those advocates within these societies fighting for their rights. An important part of the Special Representative’s mandate will be to renew the EU’s commitment to a genuine partnership with civil society. Mr. Lambrinidis expressed concern about the “shrinking space” of civil society in domestic and foreign policy. The failures of human rights advocacy often result from a lack of collective and pervasive action. By engaging EU governments and civil society actors at local, regional, and international levels, Mr. Lambrinidis hopes to empower these groups to take ownership of human rights at home, protect them from hostilities, and defend their value domestically and internationally. Finally, Mr. Lambrinidis stressed the importance of promoting economic and social rights alongside civil and political rights. In many countries, the lack of basic human rights, such as the right to food or health care, radically hinder the populations’ ability to fight for their civil and political rights. He urged that recognition of these challenges; meaningful partnerships; and cooperative strategies between the EU, the US, and other international human rights defenders will help address a broader range of human rights issues and improve the effectiveness of human rights rhetoric and practice worldwide. Since taking office, Mr. Lambrinidis and his delegation have demonstrated their commitment to the integration of human rights into EU policy and have achieved a number of successes. He shared a few of these accomplishments. Guidelines and instructions have been created for all EU delegations for protecting and promoting LGBT rights, as well as the promotion and protection of freedom of religion. After past failures, the EU, as part of the Commission on the Status of Women, adopted conclusions on the elimination and prevention of all forms of violence against women and girls in March of this year. Guidelines have been published in response to these conclusions. The EU Special Representative will continue to focus on the intersection of business and human rights, drawing from guiding notes published with a focus on the oil, gas, and other extractive industries, as well as information technology and temporary employment services business sectors in the EU. The EU has established the office and position of the Special Representative for Human Rights to ensure that human rights will play a central role in in EU foreign policy. Mr. Lambrinidis explained that the importance of this integrated approach draws from the reality that human rights violations lie at the root of most conflicts and thus, viable solutions must involve their promotion and protection. The Special Representative will be tasked with monitoring and expressing the coherence and practice of EU human rights policies, a daunting task considering the 28 member states and the countless religious, ethnic and cultural identities that comprise the EU. However, Mr. Lambrinidis stressed his optimism in the strength and capability of human rights-focused foreign policy in Europe and globally. 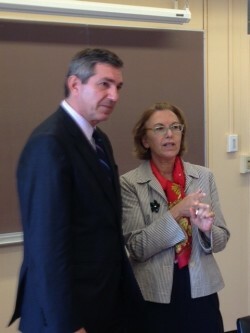 For a full audio recording of the EU Special Representative’s talk at Columbia, click here. Jillian works at the Institute for the Study of Human Rights as a Program Coordinator for the Alliance for Historical Dialogue and Accountability and the Indigenous Peoples’ Rights Program. She is an alumni of the Human Rights Studies Master’s Program, with a concentration in Indigenous rights. Her thesis and subsequent research focuses on the right to education for First Nations in Canada and the function of transitional justice mechanism in Canadian reconciliation processes. From May 23-28, 2013, I participated in the Most Mira–Humanity in Action (HIA) International Exchange. Most Mira (Bridge of Peace) is a peacebuilding NGO in northern Bosnia, and its founder, Kemal Pervanic, was a 2012 participant ISHR’s Human Rights Advocates Program. HIA is a human rights education NGO based in the US and with offices in several European countries, including Bosnia. 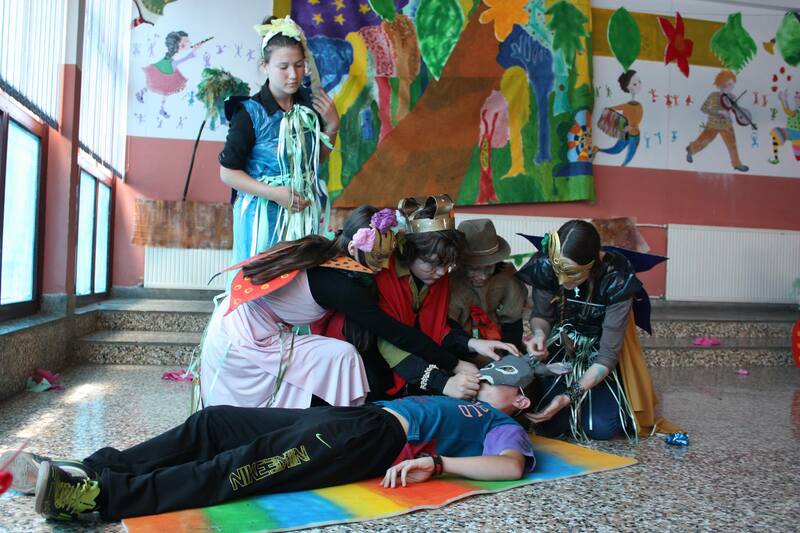 Through this project, HIA Senior Fellows supported Most Mira’s annual youth arts festival, involving children in a drama program that culminated in a rendition of A Midsummer Night’s Dream. During the 5-day festival, Senior Fellows and Most Mira staff, along with other experts in this field, also came together to discuss the challenges and opportunities that this local NGO faces within the current political context in post-conflict Bosnia. This blog post, previously published here, is a summary of my impressions and reflections from this experience. A theme that struck me throughout many of our conversations is the idea that disagreements over the narrative of what happened here during the war are a main challenge that continues to perpetuate the divide between different ethnic groups in Bosnia. Most Mira’s work is so important in this context. While the organization is not directly working on changing these narratives, their projects that engage youth through art develop both individual creativity and relationships between segregated young people. I think that this is an important first step in order to create space for people from different sides of the conflict to come together, to listen to and learn from one another. In the broader effort towards reconciliation, as one Most Mira trustee said, we have to trust the process. It seems to me that using art to open up those lines of communication is a way to start. If you pay attention, signs of the legacy of the war can be found all over Kevljani and its neighboring towns and villages. Driving down the road towards this small village, you see ruined buildings untouched since they were stripped of everything valuable during the war. With just door frames and bathroom tiles on part of a wall remaining, it’s clear that the inhabitants either were killed or have not returned because they’ve made their lives in the places to which they were displaced. Other houses are rebuilt, and you can see that the construction is new, but the lights are off. Many of these people have chosen to stay in the UK, Germany, Sweden, the US, largely because they find more economic opportunities there. They make their lives in a new place and maintain this house as home even though they don’t live there, while their children often identify less with Bosnia than with these other countries. Even for those who have returned, the buildings on their property make the memory of the war physically ever-present. Across the street from the house in which we stayed, a reconstructed home stands next to a half-built/half-destroyed structure. Why not just tear down this building and start from scratch? The clothesline hanging from the upper floor with laundry drying on it shows that this property is inhabited, but it seems that other than fulfilling this small function, the building serves no other purpose than to remind the residents of their recent past. The kids’ performance of San Svake Noći (A Midsummer Night’s Dream) was such a great example of this. The teamwork involved to create and deliver the show was so clear. It was also beautiful to watch how the show evolved throughout the course of the 5 performances. Not understanding the language of the play, I could still see how the kids responded to the audience, how they visibly became more comfortable as each performance progressed, allowing them to improvise with each other. Even though we only had the opportunity to engage with them at the end of their 4-month long project, it also definitely seemed as though new friendships were forged. I worked with one of the girls in the media group, and in her interviews with the other participants, she was quite excited to ask them about the new friends they had made. It didn’t seem important which schools they were from, except for when they had the opportunity to share the play on their own turf. Their sense of accomplishment shone through as they received rounds of applause from parents, teachers, principals, Most Mira and HIA participants, and perhaps most importantly, their fellow students. I loved watching the rapture on the faces of kids in the audience and hearing the laughter erupt at the jokes made and pranks played on stage. This interaction between the audience and the project participants allows this program to have an effect beyond the 40 children involved in the play. We were all able to see the fruits of their individual creativity, and I hope that the end result, the art that they created together, can instill some hope for the future of these children and their communities. They’re building bridges between each other. A seed of creativity has been planted, and hopefully it will be nurtured so that these kids can continue to explore new ways of interacting, growing from this basis of recognizing their common humanity. This process may not directly lead to new ways of engaging with memories of the past, but I think it’s where a process of reconciliation might be able to start. We learned a lot about the various significant political, economic, and social obstacles that exist in Bosnia today, blocking this process. Considering these challenges, I might sound a bit idealistic in saying that this dialogue and creative experience could encourage these kids to imagine and even achieve a more reconciled future. However, I believe in the healing power of art. And if you don’t start somewhere, you can pretty much guarantee that nothing will happen, but if you try, you at the very least give them a chance to develop a new, and hopefully more inclusive, story. Check out the report, Creative Commons: Engaging Youth in Peacebuilding through Art in Bosnia and Herzegovina, that we published as part of the Most Mira – Humanity in Action International Exchange. Janine supports ISHR’s Education Program and Gender and Human Rights Program, in addition to working on communications for the Institute. She is also a Humanity in Action Senior Fellow, having completed the summer fellowship program in 2009.